There are many shops,restaurants and traditional market near the Momojein guesthouse, you can use comfortably. 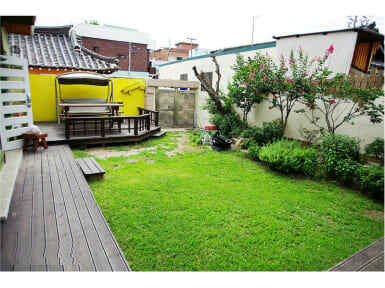 Nevertheless, Momojein Guesthouse is in a small alley(just in 10 m) in the city, you can feel very quiet and peaceful. And Momojen Guesthouse is very good traffic in the city center. The bus station and gyeong-ju train station is 3~5 minutes away on foot and all buses pass through this bus stop. There are also many attractions to walk 10~20 minutes away. (Daereung tombs park, national mueseum,Ananp-pond, cheumseung Observatory Etc.). You can feel with the convenience and comfort here. The owner can be a simple English communication. But will do my best to help you. Free tea, coffee all day. Very nice guesthouse, good location. The hostess is very nice and helpful. I had a great stay. The host has a little oasis 3 steps out of city center. The garden and patio is welcoming, the rooms are spacious (unique for a hostel in this area) and very clean. Met so many relaxed travelers here and Host was very knowledgeable. He noticed I went for runs each morning and on his own time outlined a bunch of routes (distances & average time) for me to take throughout the area so I could enjoy my time and take in different scenery each run. WiFi worked REALLY well. LOVE HIS DOG!!!! Momojein was great. The host was very nice and helpful. I enjoyed my stay here it was very easy to get around to the main attractions from this location. Excellent location. 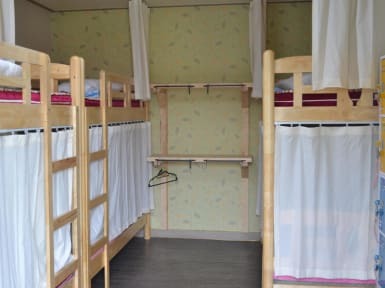 When we arrived we found that we had a Korean style room (futon bed of the floor) which I don't think we booked, however we didn't query it as we thought it would be an experience and I saw a couple of the other rooms did have a bed. The owner is very pleasant and speaks excellent English. Also the dog is very cute! A very nice place to stay with a very kind and considerate hostess. She will help you find all the information you need to visit the beautiful city of Gyeong-ju and its whereabouts. Ideal location with a calm atmosphere and smell of home made food :) Would appreciate a cleaner second bathing facility. Still, a lovely place to stay! Overall had a pleasant stay at this guesthouse. The woman who runs the hostel is very kind and has maps to help you orient yourself in the city. The bedrooms and bathrooms are tidy and the self-service breakfast coffee are great. My major complaint revolves around the very strong smell of urine in the courtyard. It made me feel sick. The dog also barks late at night and early in the morning, even if a very sweet animal. Would check out other hostels if in Gyeongju again. Lovely, quaint little guesthouse, nice manager who was friendly and helpful. Location was a little difficult to find but it was comfortable and located pretty near town centre and local town attractions. Location is not easy to find when you are first arrive this district and this city. And the door bell is not easy to notice. The staff is most friendly and helpful. The place is an old traditional house with garden hiding at the busy/shopping area. It is worth to stay at it. Hostel is pretty hard to find if you're not familiar with the area. Definitely bring GPS! The owner speaks minimal English but tries to be helpful. Overall, the hostel had very little atmosphere and provided minimal opportunity to interact with other guests. Rooms are big and clean. Watch out, though--beds are very hard and walls are thin. Bathroom in our room was weirdly configured. Breakfast is toast and coffee. Convenient location in the city for accessing the train station.